Children LOVE relaxation! But sometimes, it just takes them a few good tries to have a real taste of it that leaves them with the feeling of wanting more. Divide the kids into groups of two and have one partner be like cooked spaghetti, while the other will be the Italian chef who will check if the spaghetti in done. The chef will lift one spaghetti arm or leg at a time, and will very gently check if the pasta is “soft” by wiggling it a bit and even letting it drop to see if the spaghetti will relax or resist. This is my best technique to help the kids stay still! Put a small stone (I use glass pebbles, but you can even use crystals if you want) on the foreheads of the kids when they lie down with their eyes closed. I tell the kids that with this special yoga diamond, they can talk to animals and understand animal language, that they can see the past or the future, that they’ll be able to read thoughts, or that the yoga diamond will give them the ability to fly… all depending on the theme of the class. The magic of the yoga diamond will work only as long as it’s on their forehead; if the diamond falls, the magic breaks. This makes the kids lie down motionless and helps them to focus on the relaxation. 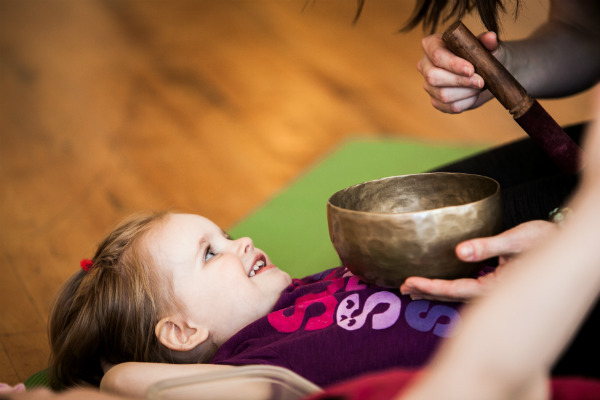 These bowls are a magical tool for focusing, relaxing and healing! The kids love it and look forward to it, and even two-year-olds will wait quietly for the magic bowl to visit them. To use the bowl, simply place it on the student’s heart or belly and hit the side of the bowl gently with the playing stick. Wow! They can feel it all over their body! Because the children depend on each other in this relaxation pose, they tend to stay stiller and longer in it. In this exercise, we lie with our head on the belly of the friend before us. We breathe deeply and feel how we lift and lower our friend’s head with our belly as we breathe, and how the same is happening to our head on the belly of the friend before us. We close our eyes and we listen and feel the breath moving like waves, helping us go deeper and deeper into the relaxation. Reflexology and other kinds of massage can be even more relaxing than relaxation! You don’t need to be a professional - just follow your heart and your hands and make it pleasant. If you massage the children too lightly, it will tickle them -- so use firm, yet gentle touch. For extra fun, use foot or hand creams that smell good for kids, like strawberry or banana! Guide the children to lie down on their yoga mats sideways and close to the front edge. Ask them to hold onto the edge of the mat with one hand, keeping their other arm beside their body. 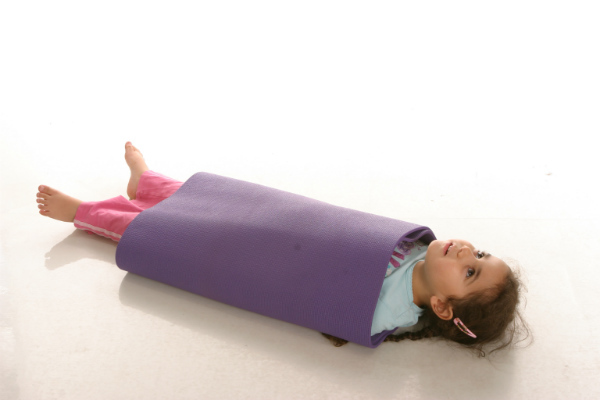 Ask them to roll toward the long part of the mat and let themselves be wrapped by it. Ask them to close their eyes and rest. The advantages of this technique are obvious, right? I often say “I will count from 10 to 1. Only when I reach 1 you can stretch and slowly sit up. 10, 9, 8… 1.” Count very slowly! Everyone lies on the floor completely still. If someone moves, they have to step over to the side. In this game we invite the action of stillness rather than saying “don’t move” which makes it more fun and more affective! Just before you lie down and relax, you can make and drink some lemonade in this way: sit hugging your knees to your chest and balancing on your bottom. Now squeeze the lemon really hard, making a super sour face. Squeeze your body into the smallest lemon ever and then let the lemon burst as your hands and legs fly out to the sides and you roll to lie on your back. This exercise shows the body the difference between tension and relaxation, and therefore assists in getting into a deeper relaxation. For most kids, being covered can really help to relax. This extra weight on the body truly helps them to stop fidgeting. Most yoga studios have blankets, but you can also choose to lie under your yoga mat in case of emergency! Do you have other ideas from your classes or from relaxation time at home with your kids? Feel free to share, we’d love to hear them!